The Fulbright Distinguished Award in Teaching is a semester-long study abroad program for K-12 teachers in the areas of best practices and global competency. “Why the Debate: How the Study of Argumentation and Debate Increases Language Proficiency” is the title of the inquiry project that I will work to develop. I am posted at the University of Amsterdam, and will work with some of Europe’s most distinguished professors of linguistics. I will frequently journal my academic experiences on this website in order to collect and share what I am finding throughout the grant cycle. First on the agenda is the Model European Parliament where high school students will gather from multiple European countries in order to deliberate issues of European policy decisions. All sessions are conducted in the English language as numerous students will speak English as their second or third language. Next, debate tournaments sponsored by the Netherlands Debate Institute will be high up on my agenda to collect qualitative information, and hopefully find a way to quantify the results for language acquisition. On January 19, Dutch Minister of Education Jet Bussemaker invited the Fulbright teachers to The Hague to discuss our inquiry projects. The minister listened to all of our project ideas, and showed interest in knowing more. We are invited back towards the end of our program where we will each give final presentations to ministry officials. Minister Bussemaker told the teachers that the idea for the teacher awards came from one of her visits to New Zealand where they participate in the Fulbright Distinguished Awards in Teaching program. She was so impressed with the exchange of talent that she proposed the idea with then-U.S. Secretary of Education Arne Duncan. 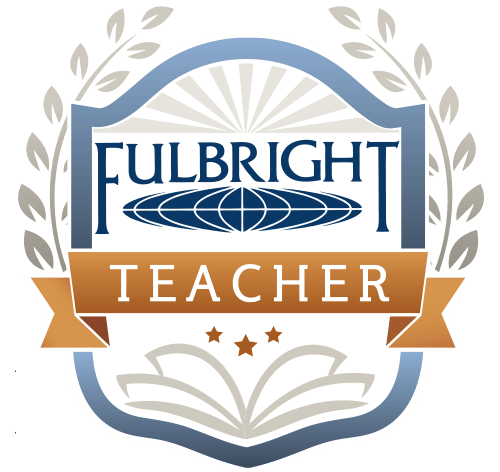 The 2017 teacher Fulbright recipients are the second cohort since the U.S.-Dutch agreement. After the meeting, the Ministry of Education and the Dutch Fulbright Center held a reception in our honor. Meanwhile, back at the University of Amsterdam, my faculty advisor Dr. Olga Fischer suggests that I audit two courses during the first block of university classes. The university does not schedule classes based on a traditional semester or quarter system, but there are three blocks of approximately seven weeks for each block through the month of June. L2 in the Classroom is taught by Dr. Anne Bannink, a professor and chair of the Department of Linguistics. The second class I will audit is Proficiency: Rhetoric & Writing taught by Dr. Roos van der Zwaard, a professor of language with emphasis on media literacy and second language acquisition. I returned to the Boneventura school to visit with Marvin van Ginkel as she was assessing students’ speaking ability. It was an excellent opportunity to sit in on one of the final assessments for students who are graduating the school. Four students held a discussion based on teacher prompts and a portfolio. What I found most interesting is how the teacher and her English department colleague are given the freedom to develop their own rubrics for assessment. I have observed many teachers in the Netherlands who assess student ability based on the textbook publisher’s rubrics. The students prepared for the assessment with a portfolio system and they prepared as a group outside of school. The students are given choice to choose one story/article from the portfolio with a study guide. Students are further asked to develop their own questions which will then be asked by another student in the group. Each student is not allowed to read their answers to the questions, but may show up to the assessment with “keywords” written down to assist them in speaking. The teacher also asks each student additional questions about the reading and assessing their speaking ability based on a rubric. Students are also given a few minutes to talk about their hobbies and interests as another section of the assessment. The Public Speaking & Debate workshops continue at the University of Amsterdam. I prepared a talk about “discussions” and how to prepare for discussions and Socratic seminars in their university courses, the different ways to develop questions, and how to move the discussion forward. Participants received a reading titled, “How to Become an Authentic Speaker” by Nick Morgan. Students will prepare for the discussion which will be held during our next session. We then used the rest of the workshop to discuss our TED-style talk. Based on the process outlined by TED CEO Chris Anderson, participants learned what types of talks not to give! We also discussed the importance of a “throughline” as they draft their talks. This was an interesting surprise. I learned recently that a university in the south of the Netherlands offers a once a year debate tournament for high school students. The tournament receives donations to make the tournament free for students, and the judges are from the university debate club, but also local politicians and public service employees (police, firefighters, etc.). So, after contacting the Cicero debate club, they were very welcoming of my visit. I travelled to Tilburg University to learn more about what the university is doing to encourage and support high school debate. It was good to see that the university students try to recruit as many local schools as possible. The students offer workshops at the local high schools where they teach debate and prep the students for the tournament with the topics beforehand. The high school students showed up at 1PM on a Friday and were done by 5PM. It was a quick tournament (3 debate rounds) because the students did not need additional prep time. Also, while organizers were tabulating ballots for the finals, each school prepared a speech to be delivered by one student. The students were in a large auditorium, and the team prepared the speech together to be delivered by one speaker. The students prepared because they knew the topic weeks beforehand. The debate finals took place, and the award ceremony included the top two debate teams, but also a speaker award for best speech. On Saturday, I attended the debate tournament offered by the Debate Stichting and Debat Unie in their Benelux series of tournaments. I traveled to Beverwijk which is north of Amsterdam for the latest tournament. There was a good turnout of student debaters who competed in debate and speaking categories. The organizers of this debate competition series have been excellent partners of mine in this journey to study debate and language acquisition. We are currently working together to create surveys in order to generate data for my Fulbright inquiry project. Back-to-back days at ROC van Amsterdam to teach debate to students who are preparing to be security officers. The lessons went well, although the topics chosen needed serious background knowledge from the students on DNA databases and zero-tolerance policing. The students had difficulty with the topics, but the objectives were to get students speaking English, and to teach them the elements of an argument. By the second day, the teacher and I decided to switch the topic to vegetarian meals in the cafeteria. With this, the students had no problem voicing their arguments. We decided to continue this teaching approach in future lessons as the teacher would like to do more in her classroom regarding argumentation and debate. Bonaventura is a junior high school about one hour south of Amsterdam. I visited the school to see how the English teachers teach speaking to their students at this school level. The teachers were gracious in welcoming the American, and I observed several classes that had a speaking and listening lesson. The students were the youngest I have observed so far in the Netherlands. My sponsor teacher shared school standards for teaching and the rubrics that the teachers use to assess student speaking. This week we focused on Part III and IV of the Cambridge Speaking Exam. I brought diagrams with a question prompt in the middle and five options for the students to discuss. As the discussion of all five options dies down, I asked the students to make a collective decision of “which one is the best” or “which one is the least” to get students to agree and disagree. This gave me the chance to assess students with their discussion skills so when I return for the next lesson we will focus on building upon each others’ ideas, or how to agree to disagree. The lesson went well, and both parts make up half of the exam. I am thinking about focusing purely on this over the next four meetings. The Public Speaking Workshops started at the University of Amsterdam. I am happy to work with the Office of International Student Affairs, and the first workshop was an excellent chance to meet the 20 participants. The first meeting was a general introduction to see if we could agree to the overall structure, meeting days and times. The agenda and brief notes are included. What can I say about this past weekend? I went to Paris! Great food, beautiful architecture, fascinating history, and a respect for the arts. An overnight bus for 19 euros sealed the deal for me as I woke up in Paris to my delight. I truly enjoyed visiting Paris, but not sure if I would want to live there for any extended period of time. The city is much larger than Amsterdam, think Los Angeles. It also seemed to have large city problems that I am not fond of, but listening to the French language in outdoor cafes is a memory that I will cherish. The art museums are the best I have ever seen. This week was a bit slow with secondary school observations. I am currently in the process of setting up four school visits with five more possibilities in April. Safe to say that I spent much time doing research at my university office this week. I also spent Friday lesson planning for next week, as I have two days worth of ESL debate lessons at ROC van Amsterdam (Southeast). We resumed our weekly lesson at ROC van Amsterdam (Airport), a vocational school that prepares students to transfer to university or work in the travel & tourism industry. It was good to see the students after a two-week hiatus. We started the lesson with preparation for Part II of the Cambridge Speaking & Listening Exam which is based on the students’ ability to answer a prompt that is positioned above a picture. The students have to describe fluently what they see in the picture. I gave the students a picture of an elementary school classroom with the prompt of discussing where bacteria and viruses might hide. Students must speak uninterrupted for one minute. We used the transitional words/phrases sheet that I gave them a few weeks ago. After this, I decided to go with the “grab bag” where students have to reach into a bag and describe an object based on touch. Other classmates then must guess the object based on the description. After this, I decided to share a game called bananagrams, and we played the word game together. Next week, I will prepare a more lengthy lesson that prepares students for Part III of the exam. The class at the University of Amsterdam is coming to an end. The block structure is new to me, but the university does not work on a traditional semester or quarter system. So, the first block is almost over and I have tried to blog about some of the readings and lectures. I am happy that I audited the course, as there were multiple connections to my Fulbright Inquiry Project. One of the professors has agreed to offer her professional advice on a survey that I will conduct with the debate community at the end of April. A teacher at one of the schools that I visit invited me to a teacher party in Rotterdam. There is a short-term teacher exchange program through the Fulbright Center in Amsterdam that allows Dutch teachers to stay in Amherst, Massachusetts for two weeks. While there, they stay with a host family and explore local schools to investigate the U.S. education system. The Dutch teacher cohort from last year invited me to a house party with an American theme. The teachers spent time catching up with each other, and it was a good chance for me to get invited to their schools as part of my Fulbright Inquiry Project. The hostess was proud that she baked a traditional pecan pie (American style), although it was not a pie, but a pecan cheesecake. She asked me what I thought as the official “American” at the party, so I had to break the news to her that it was not a pecan pie. I also told her that it tasted really good, as I am a lover of cheesecake. The National Speech & Debate Association is the national “honors society” in the U.S. speech and debate world. Their first-annual education conference is going to be held in Denver, and I have been asked to present. Initially, I will present with two other presenters in a workshop-style format. I submitted the presentation title and description after having some difficulty collaborating by email with the other presenters (one is a Latin American/ESL focus, while the other is Bulgaria/virtual debate). I hope that all three will still present together, but I had to take the reins and submit the description that is offered below. Looking forward to presenting my Fulbright findings in the Netherlands, and sharing Dutch best practices for teaching debate. The world of debate is much closer than we initially think. From Latin America to Europe, what is successful in the squad room? Our colleagues across the globe are using debate as a pedagogical tool for teaching students at every language level. This interactive session will provide participants with international strategies to teach debate to all language learners. Come to this session to find out what teachers are doing to move their students toward mastery, and the available opportunities to reach within and across borders. The series of workshops that the university’s Office of International Affairs proposed that I conduct is coming to fruition. The interest forms were due by March 1st, and is based on the flyer that I created to pique interest with international students. There is a total of 20 students interested, so I will email them next week to set up our first workshop. Many different nationalities are represented and I am excited to begin lesson planning! As I have mentioned before, the Debat Stichting (Debate Foundation) and the Debat Unie (Debate Union) are in the midst of coordinating a series of debate tournaments called the Benelux Debate Competition. On Saturday I attended their fifth tournament that took place in Hilversum. The students debated their rounds with speech rounds offered for those who do not want to debate. Once again, the organizers spent time with me and are assisting with the Fulbright project. I returned to the police and military vocational school in order to observe a class. I introduced myself and took a couple of questions from the students before they began their lesson. The students worked on the future tense with graphic organizers from One Stop English which was good to see that there is a website that the teacher uses as a supplement to the textbook. The teacher has now asked me to collaborate with her to create a lesson on debate. I think this is an exciting venture, and I will return in two weeks to implement the lesson plan. We are thinking of having a resolution that is connecting to the students’ professional interests of police and military. I thought it would be important to get out of the academic comfort zone and meet some Dutch people. I saw a flyer to assist in the organizing and setup of a Bitcoin conference. The job was a couple of hours to take tickets of attendees and help with bar service. In return, the organizers would pay in bitcoin. I have never considered bitcoin, but thought it was interesting. The presenters were from Amsterdam and Berlin. They were presenting their recent research and development with blockchain technology. So, I opened a bitcoin wallet app and am now curious to see if the value increases over time. My Museumkaart came in the mail. With access to 400 museums throughout the Netherlands at 60 euro, I thought that I would more than visit 60 euro worth of museums while I am here. I have already returned to the Rembrandt House museum twice and then decided to venture out to the Van Gogh Museum. The buildings themselves are architectural masterpieces, and of course the historic masterpieces are inside. Some of his most famous artwork (Sunflowers, Irises, Bedroom in Aries, Almond Blossoms) are located here. Like my experience at the Rembrandt House, I initially go with curiosity. My second trip will include the audio tour, and then I will continue to return to study each masterpiece. There is a Rodin sculpture and a couple of Claude Monet’s paintings. Many schools in the Netherlands had a “spring break” style week off. The schools that did not receive the current week will take the upcoming week off. This week I returned to the Wolfert Bilingual School in Rotterdam to observe a debate team practice. The practice was set up so that the students would learn by debating a round, and then wait for essential feedback from their coaches. The students are given about 15 minutes to prepare with no hard evidence. The key then is to create analytical arguments, and then to think of possible questions for their opponents during the practice round. The students debated whether parents should vote proxy for their children, in turn valuing additional citizens in the democratic process. Afterward, students received invaluable feedback from their coaches regarding speaking style, argumentation, and background information / analogies used during the round. I thought the students were speaking English mainly because I was observing the practice, as most of their practice sessions are held in the Dutch language. The students received excellent feedback from their coaches, and I stayed afterward to talk to students about debate in the United States. I gave students stickers from the Los Angeles Metropolitan Debate League. Not a college, but a mix of multiple-track secondary schools. A Dutch geography teacher who took part in the Fulbright program in the U.S. invited to visit his school located near the southeastern border town of Arnhem. I met the coordinator of the bilingual track that is one of the academic tracks in the school. The director of the program told me that they are really trying to change the intrinsic motivation of the students so that the students focus on an overall growth mindset, not just on grades. He gave me their new Attitude Tracker poster which can be found in each of the classrooms. It serves as a rubric for the students regarding their attitude (be reflective, be an inquirer, be a risk-taker, be open-minded, be a communicator). The bilingual program director said that it was not a typical Dutch approach to education, but that they wanted to try this new type of mindset among the students. The school offers a model European Parliament and a model United Nations. The model UN program is run by an English teacher who is an American from Boston, Massachusetts. I visited her bilingual English class of 8th grade students who were giving presentations on media literacy. After their presentations, the teacher asked the students to try debating because I was there. The students were excited and tried their best to argue whether or not grades should be abolished in schools. I decided to buy the MuseumKaart which gives access to 400 museums throughout the Netherlands. The card ends up being cost effective once you visit five museums, so I decided to visit one of the Dutch masters, Rembrandt van Rijn. His former house is now a museum and it is only a couple of subway stops from where I live. Round 4 – Medical experiments that involve the harming of animals should be banned. Tournament organizers have also added a separate speech category where students compete in different rounds of topics that range from “conspiracy” to “problem solving.” This Rhetoric category has become more popular among the students. The students can speak with a time limit up to three minutes. Between rounds, students are given 30 minutes to prepare from a menu of topics. Tournaments are an excellent chance for me to meet with organizers to find out more about their curriculum and school trainings. Overall, it was an outstanding competition, and I will attend the fifth tournament in Hilversum during the first week of March. and taking questions (anything from the recent U.S. election to what I think about Dutch food). Overall, I agree with the teacher that the students are at a Level 2 with their English. They had difficulty expressing their ideas and using the proper link words/transitions to connect their ideas. I have been invited back to the school in a couple of weeks to observe another English class in action. I returned to ROC van Amsterdam – Airport to teach the Cambridge Exam prep class. We have agreed that I will teach the class once a week in order to prepare the students for a high level speaking & listening examination. This week we worked on the second portion of the exam which asks students to discuss what they see in two different pictures. I started the class as a review of the first portion of the exam which is the “interview” introduction. Students introduced themselves with the transition word/transitional phrase list that I gave them. After this, we then looked at different pictures to describe what we saw going on in the pictures. I gave the students a more advanced list of transitions that they can use to connect their ideas. We will continue this exercise with more pictures the next time we meet. Next week is a sort of “spring break” so we do not have class. As I mentioned in an earlier post, the university asked me if I would be interested in teaching a series of workshops for international students. I created a flyer for the workshops, and the Office of International Students is currently distributing the flyer and briefing students on the opportunity. We’ll see if the program takes off, but my understanding is that there is some interest on behalf of students. I finished the first week of class and I appreciate how this course is directly related to my research in the Netherlands. Thankfully, I am auditing the class and am not required to accomplish the assignments. This way, I can focus on field research and I am allowed to miss class if I have an appointment in another city. I do keep up with the reading, and will post summaries and analysis in other blog posts. The professors are excellent, and I am looking forward to working with them as I try to quantify what I am finding during my research study. I taught the Cambridge Speaking and Listening class on Wednesday. This will be a recurring event as I am excited to teach students, while creating a routine for my weekly activities. The first part of the exam is a two-minute introduction. How many of us are used to speaking for two minutes in order to introduce ourselves? We discussed the importance of speaking through the two minutes. “Planned, but not canned” way of speaking is necessary to build confidence in the students. I then decided to introduce impromptu speaking, the same way I teach my high school students for competition. I gave the students abstract nouns and a few minutes to speak using a formula that allows them to transition their thoughts fluently. We ended the class with additional features of introductions, and they will start class this next Wednesday by introducing themselves for more than two minutes. As I am still early in my research, I find it necessary to map the major players in the Netherlands. The International Debate Education Association (IDEA) is one of those players, and I travelled to Utrecht to meet with Daan who administers multiple programs throughout the Netherlands and Europe. IDEA was originally founded and funded by the Open Society Foundation, but recent funding efforts are mostly written as grant projects to various European entities. We discussed the IDEA Netherlands office and the current debate programs titled Mind Your Wallet, and Debating Threats to Democracy. These debate programs offer curriculum to teachers to bring into their classrooms, and the curriculum with training makes its way into community centers to reach youth who may not have the opportunity to debate in their classrooms. IDEA provides a Debatabase for teachers to use in the classroom, as well as additional curriculum for teaching debate. Daan was extremely welcoming of my research and gave me access to their book collection where I received books published by the IDEA office in New York City. Unfortunately, the publishing aspect of IDEA is now defunct, but the books I received are written to produce middle school debates and curriculum for classroom instruction. I will follow up with Daan and the organization to see if I can attend their debate tournaments in Slovakia, as well as the trainings they offer within the Netherlands. A few develops since I last uploaded a week ago. Since settling in to my new life in Amsterdam, I started the Fulbright Teacher requirement of auditing a course at the University of Amsterdam. The syllabus for L2 in the Classroom is available while our first class focused on “What makes a good language learner?” The class meets on Mondays and Thursdays, and I am looking forward to the class as there is a team-teaching method with two professors. What’s New at ROC van Amsterdam? I am uniquely excited regarding the invitation to be a visiting teacher at the ROC van Amsterdam – Airport College, a vocational school near Schiphol Airport. I have been tasked to assist with the class on Wednesdays, where I will teach students that are preparing for the Cambridge Advanced Speaking & Listening Examination (C1). The examination is in June, and the class is experimental as the school has never offered a class to prepare students for this level of examination. I will teach students based on speaking and listening standards to prepare for the exam, but also to prepare them for their next level of education. I am still curious about why speaking and listening is in such a need everywhere I go. When I lived in Japan, speaking was the most sought after skill and the same goes in the Netherlands.There are six Toastmasters clubs in Amsterdam alone, with numerous other clubs in 20 other cities. I am also curious about why speaking is still a sought after skill in the United States, often connected to leadership. The need for speech communication continues to grow, which leads me to try to understand why we are not addressing this need in our primary and secondary education classrooms? The Office of International Student Affairs contacted me for an initial meeting, and of course I thought it was about my inquiry project and my recent adjustment to Amsterdam. The purpose was quite the contrary. The person in charge of the office told me that the university has a fair amount of students who are on a semester exchange, then there are international students who are studying for their university degree, and then there are the recent Syrian refugees that entered the university. Would I be willing to offer English workshops to the students? Would I be willing to offer specifics in speaking, listening, and debate? The answer, of course! I am now tasked with coming up with a program description and a promotional flyer for the series of workshops that are completely experimental as this has never been done before. The Fulbright Inquiry Project considers the contextual framework prior to my arrival. I can develop the framework and make adjustments as necessary. Secondly, it is important that I document and meet with the “major players” in the debate community of the Netherlands. Cogency is a non-profit organization founded by Rob Honig with a focus on the education of debate in the Netherlands. They sponsor and train students for debate tournaments and have recently developed a website to bring debate resolutions into the classroom. Further, the organization added a tri-national series of debate tournaments between schools in the Netherlands, Belgium, and Luxembourg. Called the Benelux Debate Competition, the venture strives to bring debate to more students beyond national borders. The time speaking with Rob was excellent and we have agreed to meet again to discuss classroom debate. Billed as the largest English-speaking debate competition in the Netherlands, I visited the Wolfert Tweetalig bilingual secondary school where they hold the com petition. The reason for the special one-off tournament is to determine which teams will go to Oxford University to debate in the Oxford Secondary School Finals. The Wolfert school was invited to host the regional final by the Oxford debate team which also invites other countries to participate. Oxford jurors arrived to offer intensive workshops in the morning of the competition. The judges volunteer their time and have previous training. The students know that there will be three debate rounds, what they do not know is what topics/resolutions they will debate. Each round topic is announced prior to the round, and students receive about 20 minutes to prepare arguments and possible rebuttal strategies. What is also unique about this competition is that it is billed as a learning experience as much as a competition. Rarely do students receive feedback from judges at tournaments, but this tournament offers feedback to each student after each round. Round #1 This House believes that states should give welfare to their citizens in the form of goods and services rather than cash payments. Round #2 This House will create a European Union army. Round #3 This House will make the receiving of international development aid by less economically developed countries conditional on holding free and fair elections.